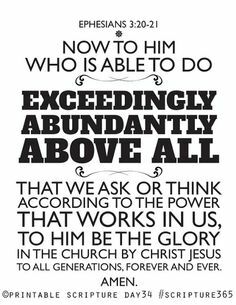 According to these words from the New Testament, there is supposed to be glory in the church in the 21st Century (“throughout all generations”)! Glory is God’s awe inspiring majesty, His soul-stirring splendor, His deeply moving magnificence, His heart-throbbing grandeur, His overwhelming resplendence! And it is supposed to be in the church today! There was great glory in the early church (check it out in the Bible book of Acts). What happened? Where did God’s promised glory go? Perhaps we’ve pushed it into the past by programming away His presence and His promptings in the present. Paul of Tarsus also refers to God’s “power that is at work within us.” (Ephesians 3:20) Your will is God’s workshop. He is continually working inside of you; nudging you to do what is right; asking you to turn away from wrong; trying to get you to listen to Him and to do what He says. God is trying make your will like His so that He can fully release His mighty power within you! God’s “power that is at work within us” is very uncomfortable and even painful. It’s like surgery–it hurts us to heal us. Yet we seldom see beyond the hurt to the healing, so we shove away His workings and do our own thing (will) instead of His. Then we act confounded concerning why we continually crash and collapse into confusion and consternation. Want a better life? Start by stepping one step in a better direction (then keep stepping) and soon you will find yourself stepping into a better place! This entry was posted in a better life, Apostle Paul, contemporary church, contemporary churches, contemporary worship, New Testament, New Testament church, New Testament quote, Spirit's flow, spiritual adventure, spiritual awakening, spiritual battle, spiritual church, spiritual connections, spiritual exercises, spiritual experience, spiritual flow, spiritual growth, spiritual healing, spiritual life, spiritual listening, spiritual maturity, spiritual presence, spiritual reality, spiritual voices, spiritual warfare, spirituality and tagged Bible, Christianity, church, Ephesians, glory of God, Paul of Tarsus, quotes, spiritual formation. Bookmark the permalink.